Khonso is named in honor of Khonso Im Heb, the ancient Egyptian brewer to the pharaohs and the gods of the dead (Osiris and Anubis). 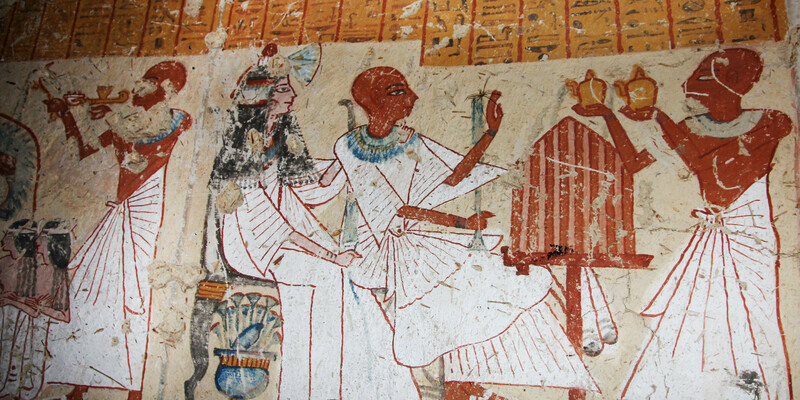 In ancient Egypt, beer was for everyone: young, old, rich, poor, women, and men. Khonso Im Heb is the first official large-scale brewer of record whose beer was enjoyed by all in the Kingdom. The name - Khonso Brewing Company - was selected by our great community which has been a part of our journey from that first brew. Khonso is founded by three friends: Kevin Downing, Corby Hannah, and William Teasley. One evening in 2013, Kevin and William were having a dads’ night out drinking imported beer when the idea of launching a brewery was shared, and the seeds of Khonso were planted. Corby and Kevin had already had this conversation during their younger years, and the three men, armed with a homebrew kit, some basic equipment, and their passion for beer, began their brewing journey as Brothers That Brew. Nine years of combined all-grain home brewing experience (nearly 750 gallons brewed), flavor experimentation, and conversations with regional and local brewers helped Khonso to take root. Before moving to GA to attend Morehouse College, Kevin grew up in Germany, Ohio, Maryland, and the District of Columbia. These places all provided unique experiences which contributed to his appreciation of varied cultures, cuisines and good beer. After exploring different craft brews with the other founders, Kevin was seduced by the home brewing bug. His unique contribution to the group is his passion for experimentation with flavors, exotic spices, and aromas. This imaginative approach to brewing allows The Alchemist to create all types of beer without an allegiance to a specific or particular style. A native of Tuskegee, Alabama William converted to craft beer when he tasted his first Samuel Adams Lager while at Boston College. During his nearly 30 years in Atlanta, he has traveled and tasted beer all over the world. Besides brewing diverse styles of beer, he is passionate about sharing the significance of beer’s origins and current trends in craft beer. William is The Artist of Khonso Brewing Company. Brewing is an extension of his passion for learning deeply, fusing flavors, committing to quality, and having fun along the way. Beer is his canvas. Raised in Austin, Texas, Corby considers beef brisket as one of the five essential food groups. He attended Morehouse College in Atlanta where he met Kevin. After graduating, he left to find his fortune in Baltimore. It was there that he experienced his first, true, craft beer experience at Sisson’s, now known as Heavy Seas Brewing Company. Since then Corby has traveled far and wide and tasted hundreds of beers. The Aficionado considered brewing school, but knew his parents would disown him for wasting his college education! His dream has now come full circle with Khonso.